About 15 years ago neighbors of a large, blighted property on Lake Street and Hiawatha Avenue in Minneapolis started making plans to improve the area. The former Brown College building — surrounded by a sea of parking spaces — had become a magnet for crime and a symbol of neglect. After years of pressure from the neighborhood, and negotiations with developers and government entities, redevelopment is finally moving forward. Hennepin County is expected to close next month on the 6.5 acre site that will eventually be home to what developers are calling an "eco-village." 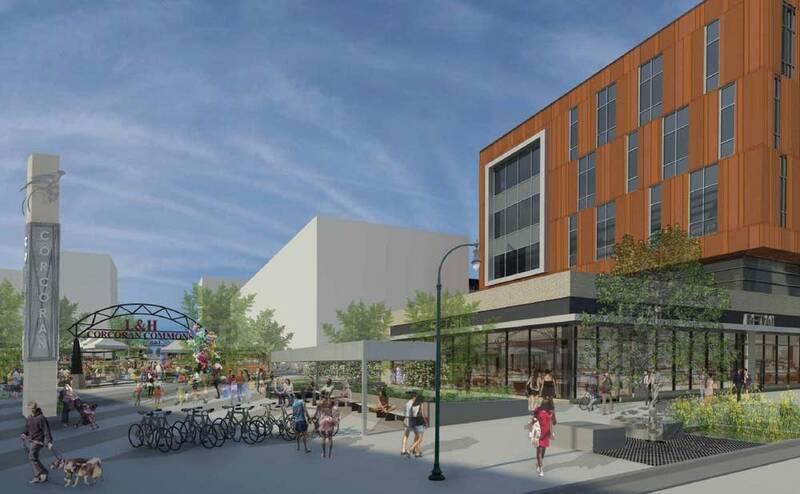 It will include 100,000 square feet of county social service offices, about 16,000 square feet of retail space and up to 565 housing units — all built around an outdoor public market close to a busy light rail stop. 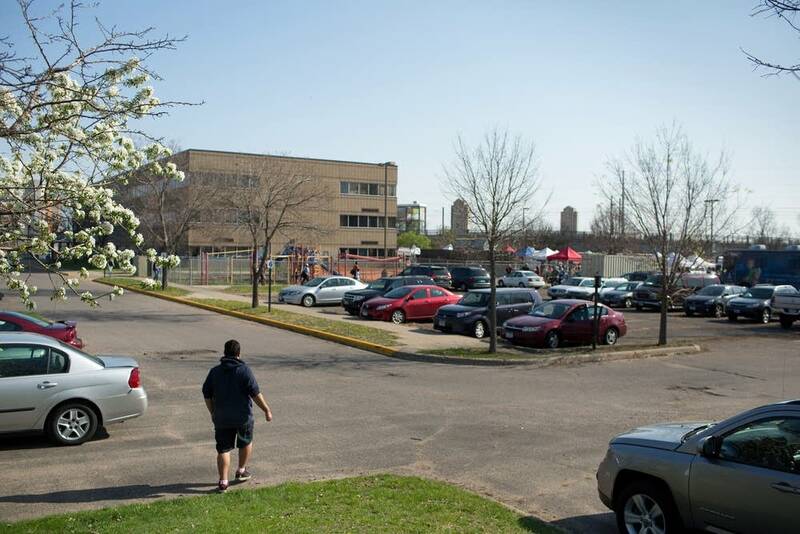 The $8.5 million agreement to buy the site from Minneapolis Public Schools will allow the county to kick off the first phase of construction as early as this summer, with the goal of moving county workers into the new building by winter of 2016. All four phases of the project could cost in excess of $200 million, said Michael Noonan, manager of Hennepin County's real estate division. Negotiating with powerful institutions like the city, school district and county has been a long process for members of the community, as Corcoran Neighborhood Organization board member Gerry Tyrrell can attest. The idea for the redevelopment goes back to a document he contributed to called the Corcoran Midtown Revival Plan — an ambitious plan adopted by the Minneapolis City Council in 2002 that outlined the neighborhood group's vision for the area. It included plans for a public market, more housing on abandoned or underutilized properties and a more pleasant and walkable Lake Street. "Along the way we saw other plans that were sitting on shelves gathering dust — that had happened over the years for Lake Street," Tyrrell said. "We're not going to let that happen here, we're going to make sure something happens in this spot." To get the ball rolling, the Corcoran Neighborhood Organization started the Midtown Farmers Market in 2003 on some of the underutilized parking lots that surrounded the building. "They'd ended their use of that building and it was empty, and there were weeds up to your waist," Tyrrell said. "Our group, in preparation for the farmers market, spent a whole day pulling weeds. We had a flamethrower trying to get the weeds out." Tyrrell said the market served as a way for neighbors to get to know one another, discuss neighborhood issues and engage with the group's vision for the area. "You can just bump into friends, you can meet people, you can support your neighbors in their small businesses that they're creating at the market — it's a dynamic community meeting place," Tyrrell said. The group wanted to clean up the "glass-strewn parking lot," but they also saw the market as a way to demonstrate the viability of their vision of an "eco-village," said Corcoran Neighborhood Organization Executive Director Eric Gustafson. "We saw the public marketplace as the anchor and the center of an eventual dense, transit village," Gustafson said. "It's starting to build our cities around food systems and around public gathering spaces the way we always used to." 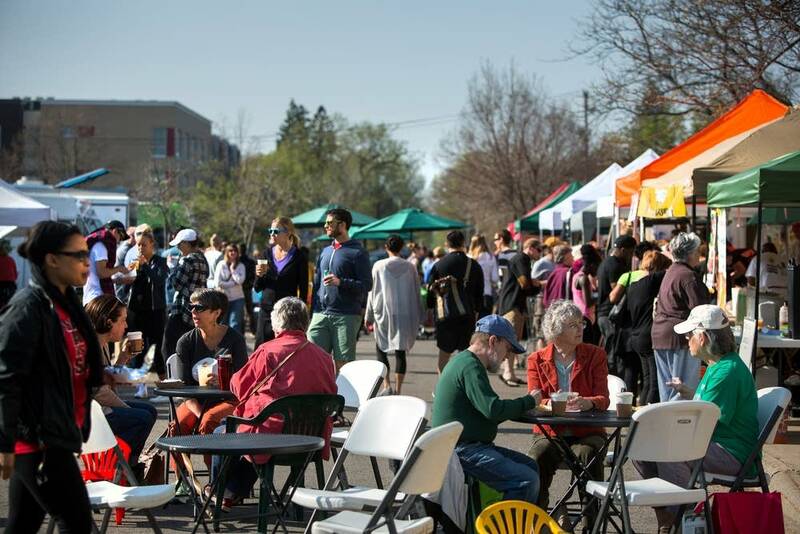 Minneapolis Council Member Alondra Cano said the Midtown Farmers Market, now entering its 13th year, has really served as a "beacon" as the city, school district and county have engaged in discussion about development on the site. "As a growth model and as a growth strategy, it's been a really smart way to start with the conversation of the public market," Cano said. "We're localizing our food system, we're implementing development strategies that are sustainable and resilient for years and years to come." A rendering of the Corcoran Commons plaza as viewed from Lake Street. Courtesy of Hennepin L&H Station and BKV Group. When Metro Transit's Blue Line opened in 2004, the parcel owned by Minneapolis Public Schools became one of the most desirable development areas in the region, said Hennepin County Commissioner Peter McLaughlin. But it was controlled by the district and housed its adult education programs, which serve about 1,000 students a day. The district realized that there was a lot of land on the site that could better be utilized by the community, county and city efforts, said Mark Bollinger, the district's executive director of facilities management and capital construction. He said the district has also tried to ensure that land they sold would serve a broader community purposes like the currently proposed development. Minneapolis Public Schools announced in 2008 that the property was for sale, but by the time the district started accepting request for proposals in 2010, the economy had tanked. Another effort by a private developer to purchase the land failed in 2013. When county officials took the leadership role in the project and tried to arrange purchase of the land, the relocation of the adult education program was one of the hangups. But the county was able to include a "leaseback" provision in the agreement to buy the land that allows the district a maximum of eight years to relocate the programs. The county will hold onto all the land and sell it off as the development proceeds into phases two through four. "It was hard, but site control was site control," McLaughlin said. "We managed because we have patience capital. We're willing to hold all the land and sell it in pieces." Selling the land also opened up the possibility of building new facilities for the adult education and other programs for the school district. 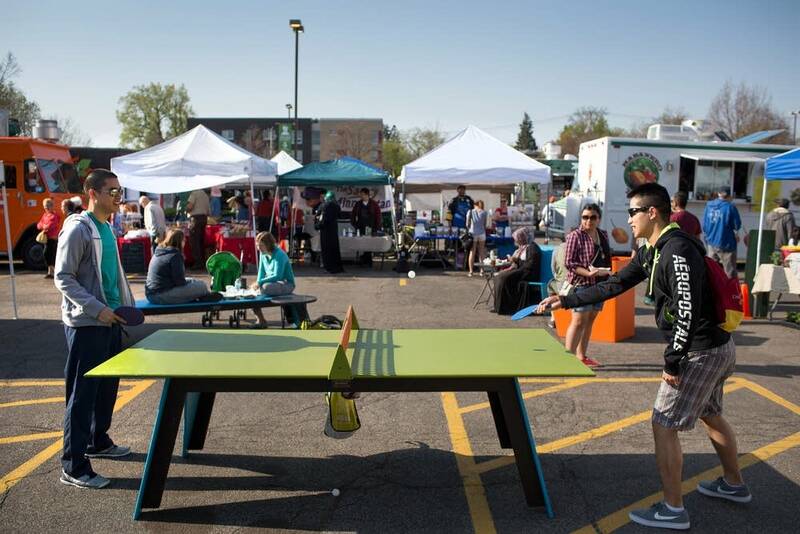 Working in concert with the Corcoran Neighborhood Organization, the district was able to identify an appropriately-sized nearby lot on 20th Avenue and Lake Street. The district is in the process of purchasing the land, and in the early planning stages for a new building to house the adult education program there. Partly due to the neighborhood's engagement, the development that's come out of the long process looks different than some new developments in areas like uptown and the North Loop, said Corcoran Neighborhood Organization Chair Lisa Barajas. She said many people in the neighborhood, especially young families, struggle with housing costs. "When we look at the potential for new development, we want to be able to address that need and not build new development for fancy young singles who have lots of money to spend, but also how can we build new housing for our existing residents in ways that they can afford." Barajas said. The first phase of the development includes the county social service offices, about 114 resident units, 8,000 square feet of retail space, 406 parking spaces covered by a green roof canopy and the relocation of the Midtown Farmers Market to a parcel of land next to the light rail. Subsequent phases of construction will start once the school district moves its adult program, and includes a permanent public plaza, which will permanently host the farmers market and about 50 other events a year, about 340 more housing units and another 8,000 square feet of retail space. It also sets the goal of reducing waste at the new buildings by 75 percent, reducing stormwater runoff and building up the area's urban canopy. The hope is that the development's proximity to both light rail and pedestrian and bicycle trails will lead 45 percent of users to use transit and about 10 percent to bike or walk. "We can build something here that's going to fill some local demand, that's going to fill some regional demand as well, and also get people close to a transit area that is already very active," Barajas said. Although the school district and county receive a lot of credit from the neighborhood for their efforts now, the relationship hasn't always been so harmonious. "Another amazing aspect of this story is what this little neighborhood organization has been able to accomplish," Tyrrell said. "We have literally set the agenda for huge institutions, bureaucratic institutions, that aren't easy to influence." Although most Minneapolis neighborhoods have official neighborhood associations, they've sometimes come up for criticism due to ineffectiveness, board power struggles or financial mismanagement. Corcoran Neighborhood Organization has seemingly been able to avoid those pitfalls. "We have professionals who no one could pay to do the amount of work that they have done on this project, and they've done it for the love of their community," Tyrrell said. One of the reasons for the neighborhood's success could be its robust outreach efforts, which has emphasized reaching out to Spanish-speakers and renters in the neighborhood. They've also succeeded in winning the support of elected officials at the city, county and school board levels. "I wish every neighborhood association operated in such a grounded way to ensure that there's inclusion for communities of color, for low-income folks and a vision for sustainability," said council member Cano. The longevity of board members and staff and a willingness to experiment may be another reason that Corcoran has been successful, said Jay Clark, program director for the Minnesota Center for Neighborhood Organizing at the University of Minnesota. "Staff and leaders who have been around for a long time who have had a collective vision of what Corcoran's role in the community was. "But every time they got knocked down to the ground, they picked themselves up, dusted themselves off and said, 'Let's try something different.'" Final approval from the city of Minneapolis is expected to be considered by the city planning commission later this month. Cano said the city is also in the process of negotiating a cooperative agreement with the county that includes requirements for providing affordable housing.